The Mountain Buggy Duet Double Storm Cover v3.0 protects your child from rain, wind and bugs. Venture out whatever the weather. Why should I choose the Mountain Buggy Duet Double Sun Cover v3.0? The Mountain Buggy Duet Double Sun Cover seamlessly attaches to your Mountain Buggy Duet pushchair to shelter baby from the sun. With a durable, lightweight mesh cover you can rest assured that baby will be protected from powerful UV rays, insects and light wind. Though your children will be safely tucked away, the minimal zip-front design still allows convenient access to the pushchair so you can lift baby in or out of the buggy with minimal effort. We should point out that while the Mountain Buggy Duet Double Sun Cover will shelter your children from the sunshine, Mountain Buggy still recommend using a sun cream alongside the product as tiny holes in the mesh do allow some sunlight through. Do I get a warranty with the Mountain Buggy Duet Double Sun Cover v3.0? Yes. The Mountain Buggy Duet Double Sun Cover v3.0 comes with a 1-year warranty (UK mainland only). The Mountain Buggy Duet Double Sun Cover v3.0 shelters your baby from light, insects and light wind. Mountain Buggy Duet v3 Pushchair is our favourite pushchair of all time. It is a double, it is narrow, it can take car seats or carrycots (available separately), it is robust, it is feature laden and perfect for travelling down the high street as well as down the country lane. The Mountain Buggy Duet v3 is the ultimate ride for siblings or twins, from newborn to toddler, offering innovation like no other, comfortably taking you from the mountains to the city streets. Being only 63 cm wide (25 inches), the Mountain Buggy Duet v3 pushchair is the same width as a single buggy. It normally fits through standard sized doorways, just check your door width first! The size of the seat itself is not compromised having a seat back height of 64 cm (25.1 inches) with full recline (for your newborn baby) or upright (for your toddler). Mountain Buggy Duet v3 Pushchair seats face forwards but key accessories can be added (available separately) to create a parent facing haven. The Mountain Buggy Duet Carrycot Plus v3, Mountain Buggy Cocoon and Mountain Buggy Protect Car Seat all allow your little ones to be parent facing. Four 10 inch air-filled tyres offer superb cushioning when cruising over rough terrain. The lockable front wheels of the Mountain Buggy Duet v3 offer extra stability when you need to go straight or over rougher terrain. The reversible cushioned liners add extra comfort and enable easy cleaning for those inevitable spillages. The easy to use 5 point safety harness has an adjustable crotch strap and shoulder straps to secure your child. Independent leg rests on the Mountain Buggy Duet v3 suit your occupants individual needs and the adjustable handlebar suits your needs for comfortable pushing. The individual hoods provide sun protection up to SPF 50+ with flick out mesh visors and silent (magnetic) peek a boo windows. An easy to use foot park brake allows for a complete stop. Showing our 5 Mountain Buggy Duet v3 Pushchair reviews with an average rating of Excellent. Would you like to write a review? Your Review - It took my son and me 2 hours to assemble two carrycot plus and blow up the tyres etc. One of the carrycot covers was too tight but we had no time to return it. 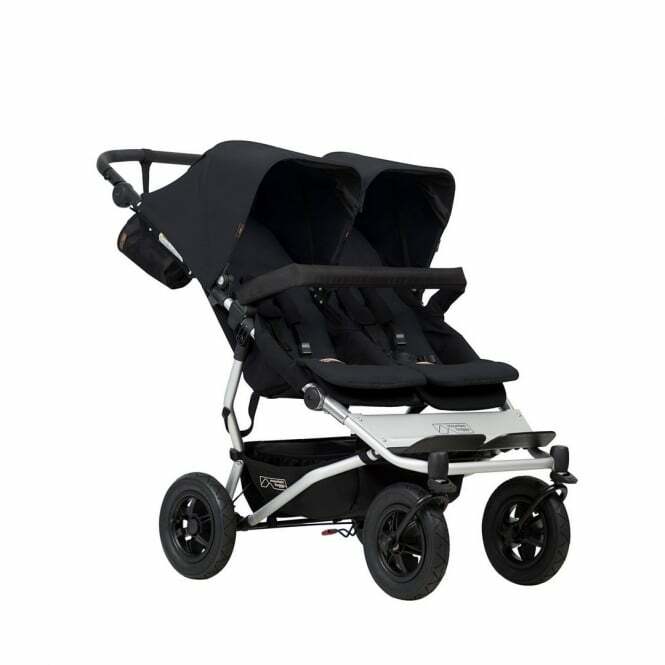 Your Review - We love this buggy! I was sceptical that it would fit through our teeny doors of our Victorian terrace but it does! And easily too!! I've had an urban jungle in the past and am currently using a lovely swift . Once our new bubba arrives , the duet will be properly put to the test, but seeing as I've already used an urban jungle(same wheel width) for a good 8 years or so, I can't see us facing any problems. Excellent quality and built to last. Very quick and smooth delivery and would highly recommend buggy baby ???? Your Review - A great twin buggy! We purchased this for our newborn twins and have found using it really easy. It fits through our doorway so getting ready and going for walks is quicker than we ever thought it'd be, The buggy is easy to push, it folds down really small considering it's a twin buggy and or little girls are comfortable inside wherever we are walking. An overall great buggy!